The vitreous is a jelly-like substance between the lens and the retina that makes up most of the volume of the eye. Usually, the vitreous gel is loosely attached to the surface of the retina. However, the vitreous can detach or separate from the retina by condensing or collapsing. This separation of the vitreous is a normal event that will happen to essentially everyone. Sometimes this happens slowly and it is hardly noticed. Often there are flashes of light and the appearance of floaters in the vision. Whenever the retina is stimulated, it records this as light falling on the retina-hence the flashes. The floaters represent condensations of protein that once were near the surface of the retina. With collapse of the vitreous gel, clumps of this protein are suspended in front of the retina, causing a shadow to be cast on the light sensitive retina by light entering the eye. Is this dangerous? Is it related to retinal detachment? 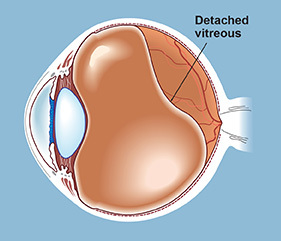 Vitreous detachment in itself is not a threat to vision. Sometimes, however, if the vitreous is more strongly attached to the retina in one or more locations, the retina can be torn when the vitreous gel collapses. If a retinal tear occurs, fluid from the vitreous cavity can move through the tear, separating the retina from the other layers of the eye and causing a retinal detachment, a dangerous condition requiring surgery. How do I know if I have a vitreous or a retinal detachment? Both of the symptoms of vitreous detachment, flashes of light and floaters, may also be seen with retinal detachment. However, one other symptom of retinal detachment is never seen with vitreous detachment only. That is the sensation that a dark curtain or window shade is being pulled across the eye. If a dark area in vision or the appearance of new flashes or floaters are noticed, a prompt retinal examination is important. What can be done about the irritating floaters? While they can be a nuisance, no eye drops or medications can dissolve floaters and surgery is usually not indicated. With gravity they tend to sink down out of the line of sight, and may become less noticeable with time.